Amazon and Twitter have teamed up to offer users a brand new shopping experience, called Amazon Cart. The service, which is now available in India, will allow you to add items to your Amazon Shopping Cart directly from Twitter. How does the Amazon Cart work? 1. Firstly, you need to connect your Twitter account to your Amazon account. Visit this page and click on “Get Started”. 2. It will ask you to login to twitter, and Authorize Amazon to access your Twitter account. (This will not allow it to change or see your password, you can always disable it from your Twitter settings). 3. Once you have done that, all you need to do is, to find a tweet which contains a link to a product on Amazon India. 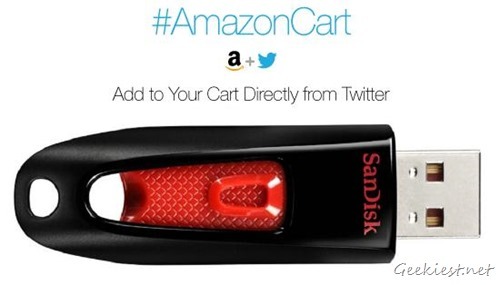 Reply to the tweet and add the hashtag #AmazonCart to it. 3. You will receive a reply from @AmazonIN, and an email confirmation, saying that the item has been added to your Amazon cart. 4. Login to your Amazon account, to checkout to buy the item. If you don’t want to purchase the item, simply remove it from the cart. This will be very useful, when you find a good discount or a special offer on Twitter, you can simply add it to your cart, and purchase the product later. Indian users can now signup for a FREE 60 days trial version of Amazon Prime.